Cress, sometimes called pepper grass, has a distinctive peppery taste that adds a distinctive, pleasing note to cheese, egg salad, or salmon sandwiches. It also makes a wonderful, nutritious addition to salads. Cress seeds grow quickly and should be ready to harvest in about two weeks. » cress seeds – packets of cress seeds should be available locally, but if you can’t find them, look online at Amazon for Curled Cress Seeds (be careful not to buy watercress, which tastes similar but has different growing needs). 1. Enjoy a boiled egg for breakfast, then remove any remaining pieces of egg from inside the shell and wash it out. 2. 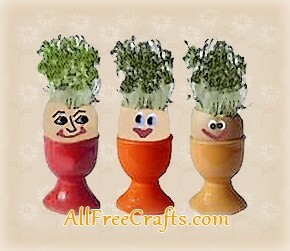 Return the egg to your egg cup, then draw or paint on some facial features. A wide range of facial expressions are possible, so you might want to practice a few on paper until you create a face that you like. 3. Dampen a little cotton wool and place it inside the egg. Instead of cotton wool, you could also pour a little potting soil into the egg and water it until the soil is damp all through but not soaking wet. 4. Sprinkle a layer of cress seeds on top of the cotton wool or soil. 5. Cover the egg with a piece of paper until the seeds begin to sprout, then remove the paper cover and move to a window sill. 6. Sprinkle with a little water every day. 7. 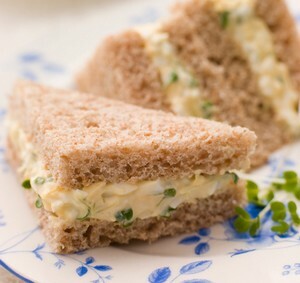 After your egg head has sprouted fully, give it a “hair cut” to make an egg salad and cress sandwich. You can add more cotton and more seeds to grow another egg head!